The Varna Community Association, Inc. (VCA) was founded in 1950 by a group of community-minded residents, and it has been in continuous operation ever since. 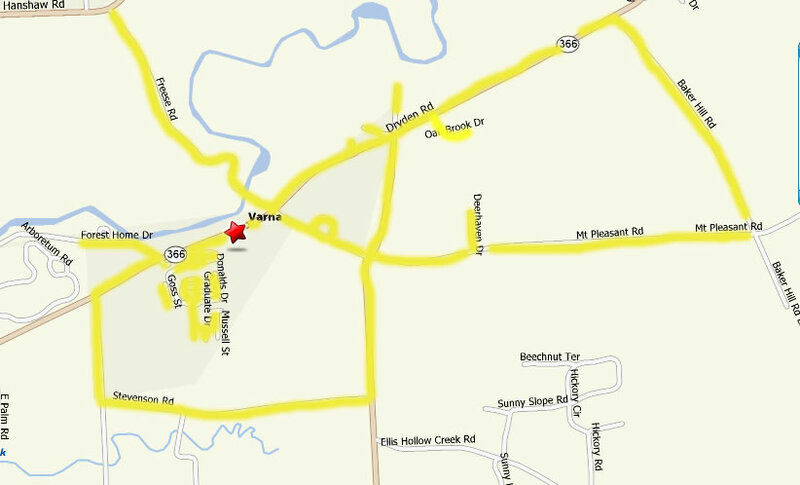 Varna is located in the Town of Dryden NY. The VCA exists exclusively for charitable and educational purposes. These include enhancing the quality of life in and around the hamlet of Varna and providing for wholesome recreational and educational activities. Anyone living in the hamlet of Varna is automatically a member of the association; there are no membership fees. Others who wish to participate in VCA activities are also welcome. For a map of the membership area, click here. The VCA is a non-profit corporation with 501c3 (tax deductible) IRS status. A volunteer Board of Directors oversees activities of the organization and maintains the VCA’s buildings and property. Meetings of the Board of Directors are open to all residents of Varna and other interested persons. Meeting times are listed on the calendar. The VCA offers a variety of programs and services to the community. These include: VASP - the Varna After School Program for students in Kindergarten to Grade 5; public meetings with elected officials on topics of particular interest to the hamlet of Varna; weekly open meetings of Alcoholics Anonymous; a polling site for local, state and national elections and the Ithaca City School District; an annual award opportunity for a Tompkins Cortland Community College (TC3) student living in Dryden; a quarterly newsletter, the VARNA NEWS; family events; and a free Thanksgiving dinner open to the public. The VCA owns and operates a building known as the Varna Community Center located at 943 Dryden Road (NY Rte 366). The Community Center is used for VCA-sponsored programs and public and private activities. The Community Center’s accessible building houses the Varna After School Program and is also used for meetings, workshops, recreational and social events. The grounds of the Community Center include ample parking, a sizable lawn and a playground. Individuals and groups may rent the Community Center facilities. Free WiFi internet access is available for public use. The Community Center has two rooms that can be used for meetings or other gatherings. The large room holds a maximum of 85 people and is equipped with 12, 8-foot tables and 80 chairs. The floor is linoleum. The small room is carpeted and holds a maximum of 54 people. There are 4, 6-foot tables and 40 chairs. Both rooms are heated and have ceiling fans. The Community Center’s commercial kitchen is certified by the Tompkins County (NY) Health Department. Kitchen facilities include double ovens, 10-burner gas range, reach-in cooler, dishwasher, ample counter space. Use of dry storage, walk-in cooler, freezer and dumpster can be negotiated. Long term rentals require a lease and proof of liability insurance. Long-term kitchen rental fees are determined on a case-by-case basis. Individuals and groups are welcome to inquire about renting Community Center facilities. The best way to contact the VCA’s rental coordinator is via email: Rentals@varnacommunityassociation.org. Use the calendar to check availability of a particular date. For a list of rental fees for one-time rentals, click here. All renters will be asked to provide proof of liability insurance.